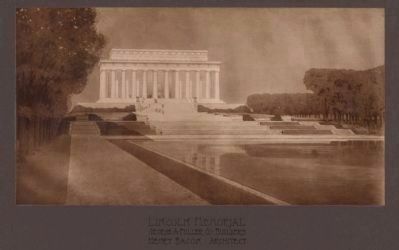 Architect of the Lincoln Memorial in Washington and many other public structures. Home is here, grave, Oakdale Cemetery. Location. 34° 14.033′ N, 77° 56.759′ W. Marker is in Wilmington, North Carolina, in New Hanover County. Marker is on South 3rd Street (U.S. 74) 0.1 miles south of Dock Street, on the right when traveling south. Touch for map. Marker is in this post office area: Wilmington NC 28401, United States of America. Touch for directions. 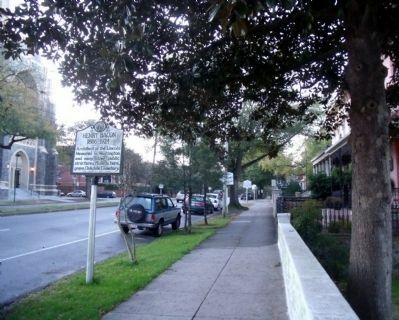 Louis Toomer Moore (about 300 feet away, measured in a direct line); William E. Worth House (about 300 feet away). Touch for a list and map of all markers in Wilmington. George A. Fuller Co. Builders. Henry Bacon Architect. More. 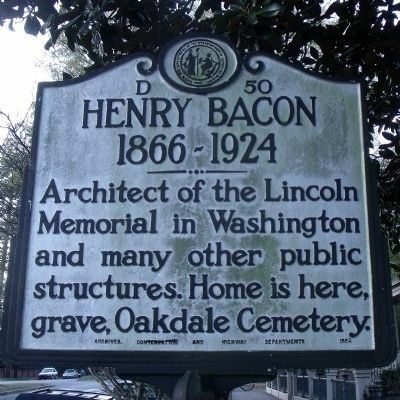 Search the internet for Henry Bacon. Credits. This page was last revised on June 16, 2016. This page originally submitted on March 17, 2010, by Bernard Fisher of Mechanicsville, Virginia. This page has been viewed 656 times since then and 4 times this year. Photos: 1, 2, 3. submitted on March 17, 2010, by Bernard Fisher of Mechanicsville, Virginia.